Well, that didn’t even make sense. Even my sports/TV/Movie mashup title is more logical than a result that sees the Ottawa Gee-Gees, the consensus No. 2 team in the country — and which claimed the top ranking for a time after defeating the Carleton Ravens in January — being so thoroughly whipped. 93-46. Ninety-three to forty-six. 46?! UOttawa is the highest scoring team in the country, with one of the nation’s top scorers in “Johnny Basketball” Berhanemeskel and a collection of other gunners. Not Sunday. The Gee-Gees were devastated. I couldn’t get the lost look on fifth-year post Gabriel Gonthier-Dubue’s face out of my mind; Johnny B wore a haunting mask of stunned sorrow. (And they had to stand there for soooooo long! Celebration, a zillion photos, interviews, all this before the formal announcements of the Players of the Game, the tournament MVP and All-Stars, before the GGs bowed their heads to receive a silver medal that they won’t appreciate for years, and before they watched the Carleton Ravens, for the second straight year, accept the gold that they seem to win so routinely now. 11 W.P. 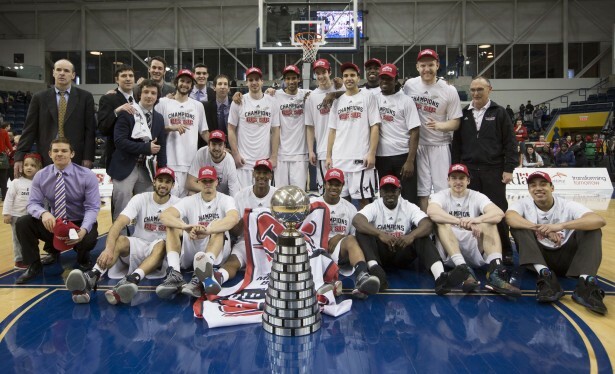 McGee trophies in 13 years constitutes a habit, and for the rest of the Canadian university basketball hopefuls, it’s become an utterly intimidating one. Don’t forget, they lost narrowly in the national semis in those other two years! Meanwhile, UOttawa has never won gold. And they had to stand at least 15 minutes and watch Those Guys.) They stood there SO LONG. WARNING: Contains basketball. And other things. The Mattamy Centre is a great place to watch ball. It’s tiny by NCAA standards, seating about 5000, and it’s not close to full. There may be 2000 to 2500 here now, and at least a third, maybe half, are school children — judging by the waving “thunderstix” (who is the genius that we thank for this invention?) all around the bowl bopping along to “Clap along if you feel like happiness is the truth…”. (I wasn’t among them, but they made me smile.) The floor is laid over a hockey rink, though it’s three storeys above the old MLG’s sacred surface. There are four rows of courtside seats opposite the scoring table and team benches. Big brother Thomas hasn’t scored much yet as of 31-13, but he’s getting the shots he wants.